Air conditioning filter in the house or offices is used to remove solid contaminants such as smoke, pollen, dust, grease and pollen to ensure better air quality for the occupants. A study showed that indoor pollution is common these days due to the chemicals that are used in household furnishings and various goods. 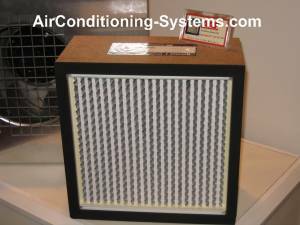 These filters are usually placed on the return air of the air conditioning system. The air that contained the contaminants are trapped here. Clean air is then discharged into the space together with the cool air. Plastic mesh filters are commonly installed at the return air of most indoor unit of room or window air conditioner. They trapped bigger particles of dust and should be cleaned every two weeks and more frequent if the space being conditioned is polluted. If you look at the manual, they are easy to take out from the unit. Wash thoroughly with water and household dish washing detergent to remove dirt that stuck to it. Leave to dry and put back. An air filter on display during one of the HVAC exhibition. These simple steps of cleaning help to ensure the efficiency of the unit and hence save electricity as well besides providing a cleaner air space for you. Electrostatic air filters are commonly placed in the return air of the air conditioner unit where the air is subjected to high voltage up to 12kV between two plates. The ionized particles are then drawn to the grounded plates. The electronic circuit used to generate the voltage is usually embedded on the control printed circuit board or a separate module. Carbon and Adhesive filters are other types used. Carbon type is made of activated carbon that is effective in removing odour causing gases and bacteria. Adhesive type is made of cotton and fiber glass material coated with adhesive oil or liquid which trapped the particles. The sizes of contaminants that exists in our air ranges from 0.01 microns to 10,000 microns. Virus, oil smoke, fumes and suspended impurities have sizes ranges from 0.01 to 1 microns. Mold, pollen, fog, dust, mists and ashes ranges from 1 to 100 microns. Dust emitted from heavy industry factories is about 100 to 10,000 microns. The ability of the filters to trap particles is measured by using the industry standard known as MERV or Minimum Efficiency Reporting Value. The values ranges from 1 to 20 and can trap particles sizes from 0.3 microns to 10 microns. The higher the value, the better it is able to trap smaller particles. Residential applications usually ranges from 1 to 12 with MERV 12 able to trap particles from 1 to 3 microns. Highly specialized applications such as clean room and surgery room use MERV 16 to MERV 20. Most household use HEPA air purifier to remove the contaminants from the air. See the basic features of this equipment. This cleaner cleans the air electronically by using electric field to trap the particles. Find out how to save energy bills by utilizing an economizer in your HVAC System. Here are the basic components that constitutes an AHU. This unit is used in commercial buildings, factories and offices.